Santa Fe is fortunate to have many excellent restaurants in all price ranges and with varied cuisines. 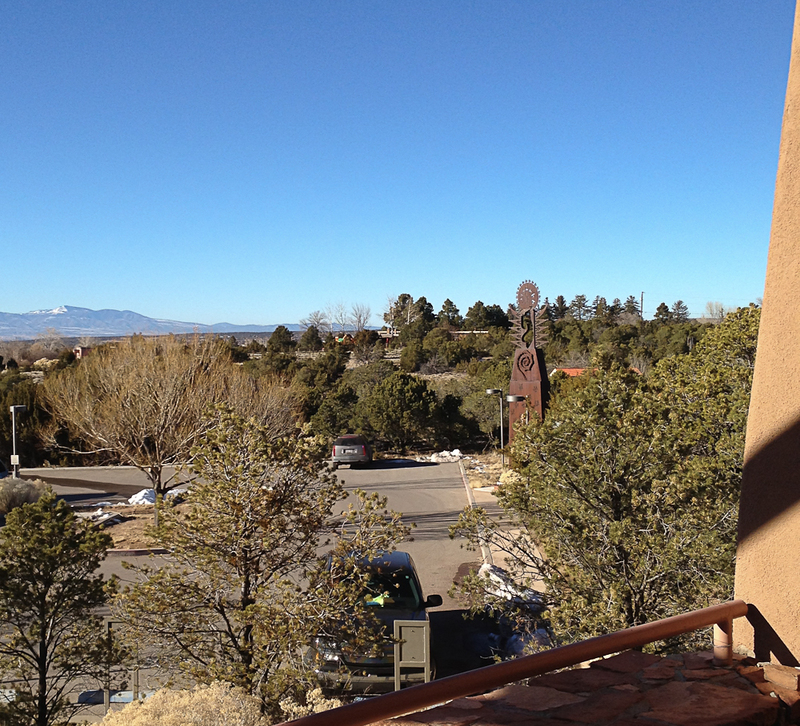 Santa Fe is also lucky to have a great number of outstanding museums. The museum within the Governor’s Palace, the Georgia O’Keeffe Museum, the Museum of New Mexico History, and the Museum of Art all cluster near the Plaza, and they are popular with both tourists and locals. Of course, you can make a day of it and take a lunch and/or dinner break in one of the many excellent restaurants nearby. Less well-known is the collection of museums on Museum Hill surrounding a central plaza with a spectacular view. These include the Wheelwright Museum of the American Indian, the Museum of Indian Arts and Culture, the Museum of International Folk Art, and the Museum of Spanish Colonial Art. They are all extremely well done with fascinating collections and frequent travelling exhibits. There is so much to see that you cannot possibly see everything in a single day. If you can, though, you should plan at least a full day. If you do, you will also want a nearby place for either a quick or leisurely lunch. The Museum Hill Café is the perfect place, because it is right on the central plaza with the same spectacular view. On a recent visit, we arrived around one in the afternoon, a little after the lunch rush. That may have been a mistake because they were out of our top choices: grilled salmon with mango salsa and smoked duck flautas with mango purée. Still, there were a lot of other excellent choices including several specials, a variety of soups and salads, as well as hot and cold sandwiches. 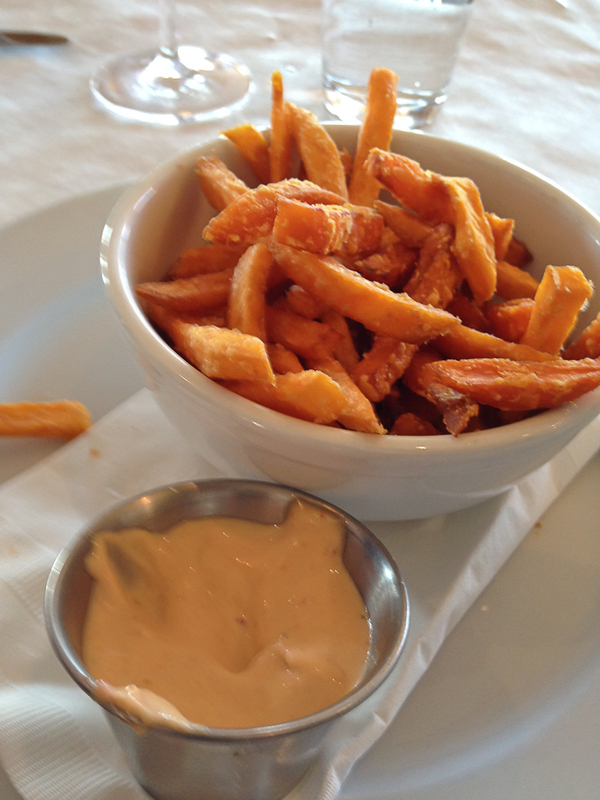 Even before we ordered they knew that we wanted an order of sweet potato fries served with chipotle sauce. How they knew that, I’m not sure, but they were right – and the fries were exceptionally tasty. In general I am not a big fan of sweet potato fries because they usually come from the kitchen soggy and greasy. Not so with these; they were fresh, crisp, and without a hint of grease. My substitute choice was their special Asian shrimp taco plate. It was served as a beautiful array of three small soft corn tortillas loaded with shrimp, small chunks of clementine, and a spicy Asian sauce. On the side was some finely shredded Napa cabbage to heap on the tacos along with a tasty pico de gallo. I must say I soon forgot the duck flautas though I plan to return for another try at those. Susan ordered the vegetarian plate, which our daughter-in-law had ordered on a visit the previous week. The plate consisted of a beautiful presentation of a savory lentil dal, orzo, edamame, and a lightly dressed green salad. The wine selection, though small, is well-chosen and excellent for lunch. We both ordered a glass of New Zealand Sauvignon blanc – light and just right with our food – and also non-filling so that there was still room for dessert. 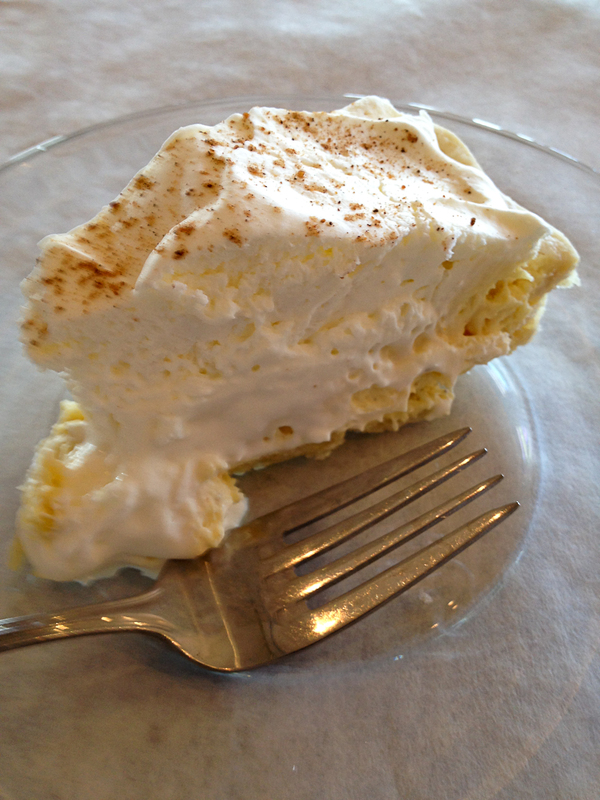 That meant sharing a big slice of eggnog pie – a sweet and mellow ending to a relaxing lunch. Did I mention the view? Did I mention that the café is also very kid-friendly? There were several families enjoying themselves in a modern but tastefully decorated room with well-chosen art and the bright sun pouring in through the glass walls.